COMING UP -- watch this page for dates & times! Workshop fee: $25 per person (advance registration required) includes three semi-dwarfing apple rootstocks, apple grafting wood of your choice, and all necessary supplies. Call (989) 724-5272 or stop in at 320 S. State Street, (US-23) in Harrisville to register. Required: A signed safety statement and waiver of liability by ALL participants. Saturday, May 4, 2019 - 9 a.m. - 2 p.m.
Come and check out our selection of conifer and deciduous seedlings as well as ornamental shrubs and flowering plants, fruit trees, and wildflowers. The Alcona Conservation District is hosting a spring mushroom hunt on Saturday, May 25, 2019 from 10:30 a.m. to 1:00 p.m. at a forest on Bischoff Road in Iosco County near Tawas City. Using GPS, Anderson Rd. is the cross street or use GPS addresses 1561 through 1799. 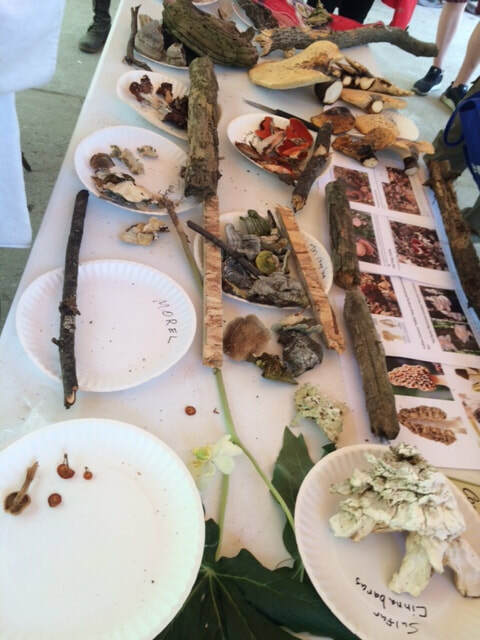 Sister Marie Kopin, a mushroom specialist from the Michigan Mushroom Hunter's Club, will be on hand to educate and identify collected mushrooms. Dress for the weather! Port-a-Jons on site. No charge, open to the public. WHEN: Wednesday, December 5, 2018 from 6 p.m. - 8 p.m.
We will be holding our Annual Meeting and Election. 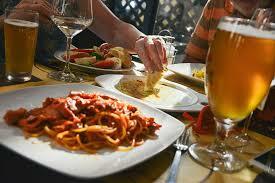 Dinner begins at 6 p.m. Dinner tickets are $10. SPEAKER: Kurt Dalman, Natural Resource and Conservation Services Technician. 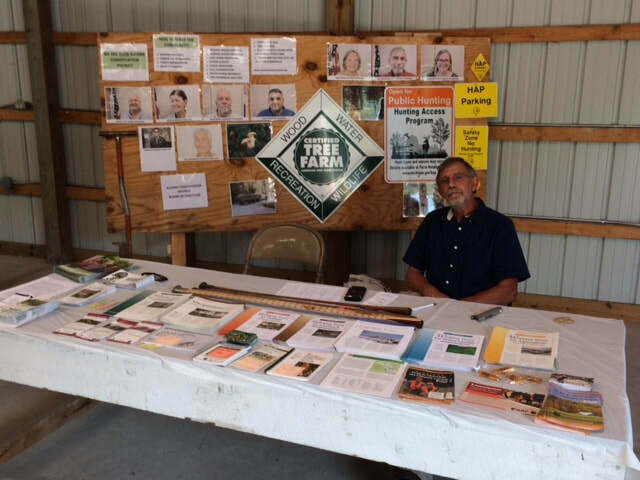 Kurt will discuss NRCS programs and cost shares available to landowners. Please RSVP on or before November 26, 2018. Drawing for door prizes will be held. A Timber and Taxes workshop will be held on Saturday, November 10, 2018 from 1 pm to 3 pm at the Alcona Conservation District Conference Room, 320 S. State St., Harrisville, MI. 48740. FIND OUT: $ How U.S. tax laws favor timber land ownership - what the big guys know! 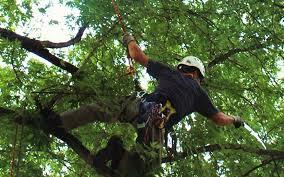 $ How to handle income from a timber harvest - the right species of forms. $ How to start keeping the right records. 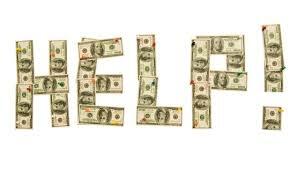 $ How to cut your property tax bill with state incentive programs! RESERVE YOUR SEAT NOW! CALL (989) 724-5272! Wednesday, November 7 - 7-8 p.m.
Eric Brandon, CF, will discuss invasive species and the risks they pose to the Northern Lower Michigan area. This program is free to the public. Call (989) 724-5272 for further information. No registration needed. WHEN: Saturday, October 6, 2018 - 10:30 A.M. - 1:00 P.M. 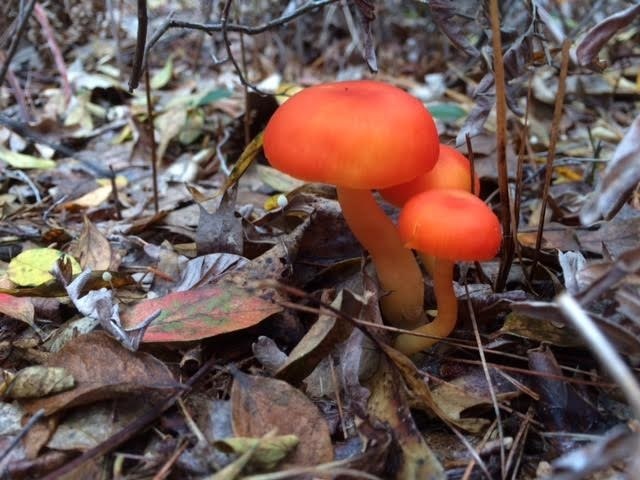 The Alcona Conservation District is hosting a fall mushroom hunt on Saturday, October 6, 2018 from 10:30 a.m. to 1:00 p.m. at a forest on Bischoff Road in Iosco County near Tawas City. Using GPS, Anderson Rd. is the cross street or use GPS addresses 1561 through 1799. Sister Marie Kopin, a mushroom specialist from the Michigan Mushroom Hunter's Club, will be on hand to educate and identify collected mushrooms. Dress for the weather! Port-a-Jons on site. No charge, open to the public. We Do the Work - You Get the Check! When: Friday, September 21, 2018, 6-7 p.m.
FREE Program: Eric Brandon, CF, Conservation District Forester, will explain how the program works and answer your questions, whether you are a resident or absentee landowner in Alcona County. Call (989) 724-5272 to reserve your seat. Light refreshments will be served. WHEN: Saturday, May 26, 2018 - 10:30 A.M. - 1:00 P.M. The Alcona Conservation District is hosting a spring mushroom hunt on Saturday, May 26, 2018 from 10:30 a.m. to 1:00 p.m. at a forest on Bischoff Road in Iosco County near Tawas City. Using GPS, Anderson Rd. is the cross street or use GPS addresses 1561 through 1799. Sister Marie Kopin, a mushroom specialist from the Michigan Mushroom Hunter's Club, will be on hand to educate and identify collected mushrooms. Dress for the weather! Port-a-Jons on site. No charge, open to the public. 1:25 p.m - 3:15 p.m.
Saturday, April 21, 2018 - CANCELED! Saturday, February 24, 2018 from 1 - 3 p.m.
Alcona-Iosco forester Eric Brandon will lead you through a fascinating tour of the winter woods and teach you to recognize common tree species even when they have no leaves. Alcona Conservation District and the Forestry Assistance Program present a free program! 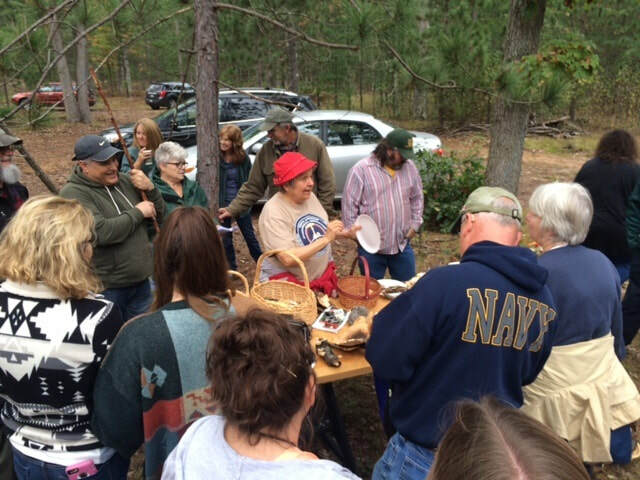 Sister Marie Kopin, Mycologist, instructs attendees at the 2017 Fall Mushroom Hunt. Tuesday, September 26, 2017 at 1:00 p.m., Harrisville Branch of Alcona County Library. Host: Sunrise Gardening Club. WHEN: Saturday, May 20, 2017 - 10:30 A.M. - 1:00 P.M. The Alcona Conservation District is hosting a spring mushroom hunt on Saturday, May 20, 2017 from 10:30 a.m. to 1:00 p.m. at a forest on Bischoff Road in Iosco County near Tawas City. Using GPS, Anderson Rd. is the cross street or use GPS addresses 1561 through 1799. 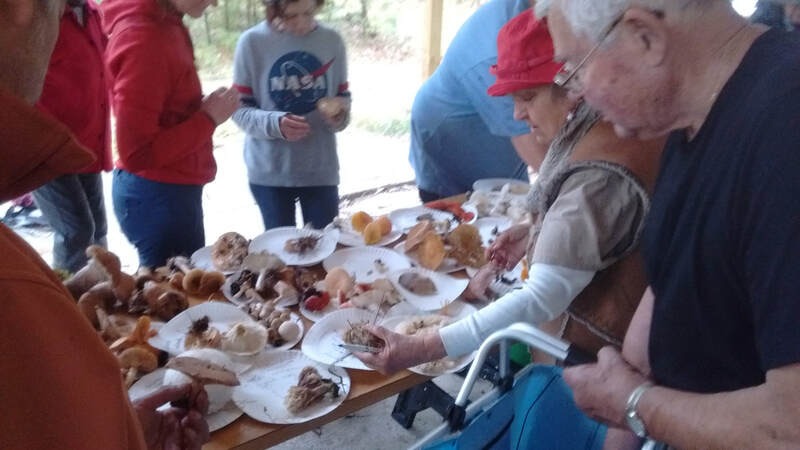 Sister Marie Kopin, a mushroom specialist from the Michigan Mushroom Hunter's Club, will be on hand to educate and identify collected mushrooms. Dress for the weather! Port-a-Jons on site. No charge, open to the public. WHEN: Tuesday, May 2, from 5:30 - 7:00 p.m.
WHAT: Field grafting demonstration of pears onto dwarfing quince rootstock by Joe Lukasiewicz and Eric Brandon. Open to the public, this is a free demonstration of "field grafting" of pear scions onto dwarfing quince rootstocks to convert wild seedling quince shrubs to pear trees. Instructors will cover cloning of trees by grafting, safety concerns when grafting, different budding and grafting techniques, and post-grafting care of trees. 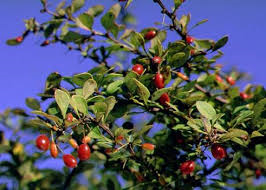 The process to be demonstrated can be used to propagate other fruit and nut trees, shrubs, and some flowers like roses. No pre-registration required -- just show up! Saturday, April 29 10:00am-2:00pm at the Harrisville Branch of the Alcona County Library, 312 W. Main St., Harrisville. Workshop fee: $25 per person (advance registration required) includes three semi-dwarfing apple rootstocks, apple grafting wood of your choice, and all necessary supplies. The Alcona Conservation District and the Harrisville Institute for Cultural Learning are sponsoring a fruit tree pruning demonstration on Friday, April 7, 2017 beginning at 6:30pm. The program will be held on the property of J. B. Cook located on the west side of US-23 just north of the Black River Bridge (there will be signs). We will be pruning semi-dwarf apple trees. The demonstration is for backyard growers or hobbyists and not intended for those with commercial interest or high density plantings. The program is open to the public. There is no charge to attend. "1491" - Discussion of the Americas before European discovery. Forester Eric Brandon will explore how Native Americans managed the land and the forests. Public welcome. Request a copy of the book "1491" to read prior to attending this discussion. WHEN: WEDNESDAY, DECEMBER 7 - 5:00 TO 7:00 P.M.
Saturday, October 8, 2016, 10:00 a.m. - 1:00 p.m. at 1561-1799 Bischoff Road, Tawas City. Use the interactive map at the right for directions. 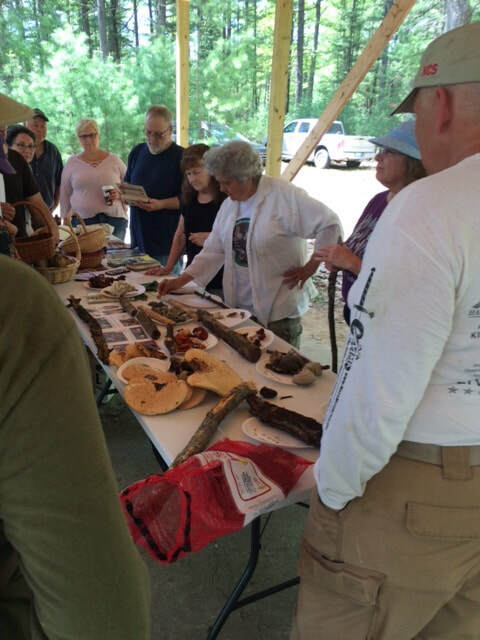 Sister Marie Copeland, a mycologist from the Michigan Mushroom Hunters Club, will be on hand to guide and educate. Dress for the weather! Thursday, September 8, 6:00 p.m.
Phillip Korjeha, DNR Forest Health Specialist, will discuss Oak Wilt and the implications it has for our forests. When: Friday, August 26, 2016 2:00 p.m.
Invasive species are species that are non-native to the ecosystem under consideration, and whose introduction causes or is likely to cause economic or environmental harm or harm to human health. Please call (989) 724-5272 to reserve your seat. Admission is FREE! WHEN: Tuesday, May 24 from 6:30 to 8:00 p.m. 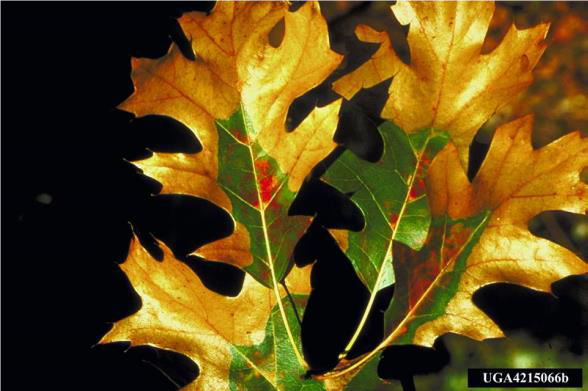 This is a FREE forest health presentation open to the public geared toward landowners, foresters, loggers and anyone with invested interests in oak forest types. 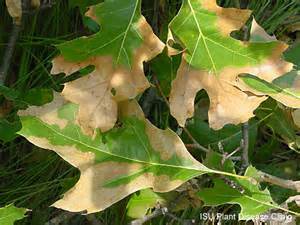 PHILLIP KURZEJA with the DNR Forest Resources Division will be giving an in-depth presentation on oak wilt, including the science behind the disease, signs and symptoms for detection, treatment options, and the latest updates. When: Friday, April 8, 2016, 5:00 to 7:00 p.m.
Where: Orchard of JB Cook, US-23, 7-1/2 miles north of Harrisville, just north of Malaski Road where Black River crosses US-23. TWO FRUIT TREE GRAFTING SEMINARS..
Where: Parks Library (Oscoda Public Library), 6010 N Skeel Avenue, Oscoda Township on the old Wurtsmith Airport Base. Time: Both sessions run from 10 a.m. to 2 p.m. If you own forested property and you have harvested timber within the last three years, you won't want to miss this workshop! If you're thinking of harvesting timber or purchasing forested property, this workshop is for you! Money earned from a timber harvest is taxed differently than earned income, and many factors affect the taxes you owe. Don't overpay - get educated and save! Susan Metcalfe of Metcalfe Forestry LLC and the Alcona Conservation Distrivct will present this informative workshop. Call (989) 724-5272 for additional information and registration. Attendance is free, but seating is limited. When: August 29th 2015, 10 a.m. If you own forested property and would like to better understand how your property can be less of a financial drain and more of a recreational paradise, you won't want to miss this event. This lecture will focus on various assistance programs, tax exemption programs, and methods of managing forested lands in order to pay the bills and enjoy the landscape all at once. 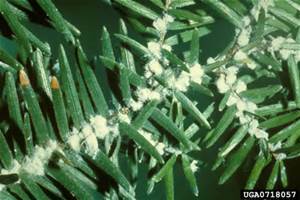 When: July 18th 2015, 10 a.m.
Invasive species are some of the most important threats to the health of our forests in Michigan and abroad today. Join us and learn how to ID and control some of the most common invasive species present in Michigan today. 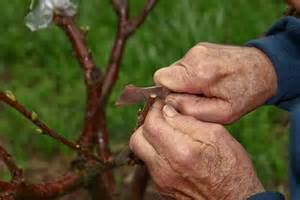 When: July 1st at 10 a.m.
Greenwood budding allows growers to propagate hard-to-graft trees like walnut and heartnut. 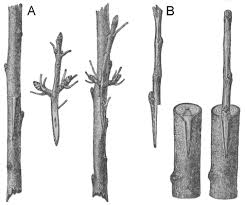 Unlike fruit tree grafting which is done with dormant stock in early spring, greenwood budding is done during the growing season using new season wood. This method can be used from late May to mid-July in Michigan. The demonstration will last approximately 1 hour. 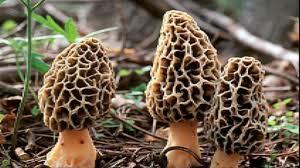 Participants can expect to collect mushrooms and discuss ID characteristics with a Mycologist from the Michigan Mushroom Hunters Club. This event is free and open to the public. Please dress for the weather. Use the interactive map to your right to determine directions. When: May 16th 2015, 10 a.m. 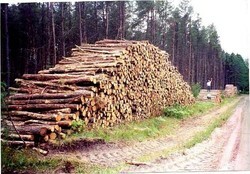 If you have ever thought that the only thing worth a buck growing in your woods were the trees, think again. This lecture will highlight some common and some more obscure methods of turning a profit without selling stumpage. When: Saturday March 14, 10 a.m. 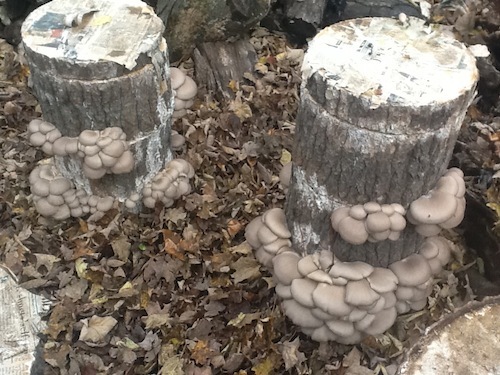 Growing your own mushrooms can be fun, easy, and good for the forest. This workshop will introduce you to mushroom forest farming and give you the tools necessary to start your own mushroom farm. When: January 18th 2015 9 a.m.-5 p.m.
To register for the event or for more details please call District Forester Andrew Beebe @ (989) 335-1056. Follow the link below to see the event flier. Click here to see news coverage of this event! When: Sat. December 13th, 10 a.m.
﻿ Join us and learn the basics of forest management, forestry, and silviculture. This event will briefly cover how foresters manage forests from start to finish and the ideology behind silviculture. Join us for a tour of the Iosco Conservation District's 80-acre property. During this tour you will see an active timber harvest, learn about the long-term plan for this property, and have an opportunity to discuss the science behind sustainable forestry. When: Oct 25th 2014, 1p.m. When: Oct 1st @ 10:30 a.m.
What to expect: Participants should expect to be on their feet for a few hours and should dress for the weather. Please bring a paper bag and a knife for collecting. We are asking for a $5 donation if you can donate. Do you have questions about the state of the forest, forestry, trees etc? Come on out to Lumbermans monument on Saturday August 16th from 1-2 and lets talk forests! Come out and learn about water quality related to agriculture and forestry. This event will take place Aug 19th from 12-4 p.m. at the Alcona Fair Grounds. If you would like to have your well water tested for free, please fill out the "Drinking Water Well Screening" form to the left. This event will take place 10 a.m. at the Oscoda Township Parks Library. We will spend most of the class indoors; however a brief field session will also take place a short drive away from the library. Please call District Forester Andrew Beebe @ (989) 335 - 1056 to register. 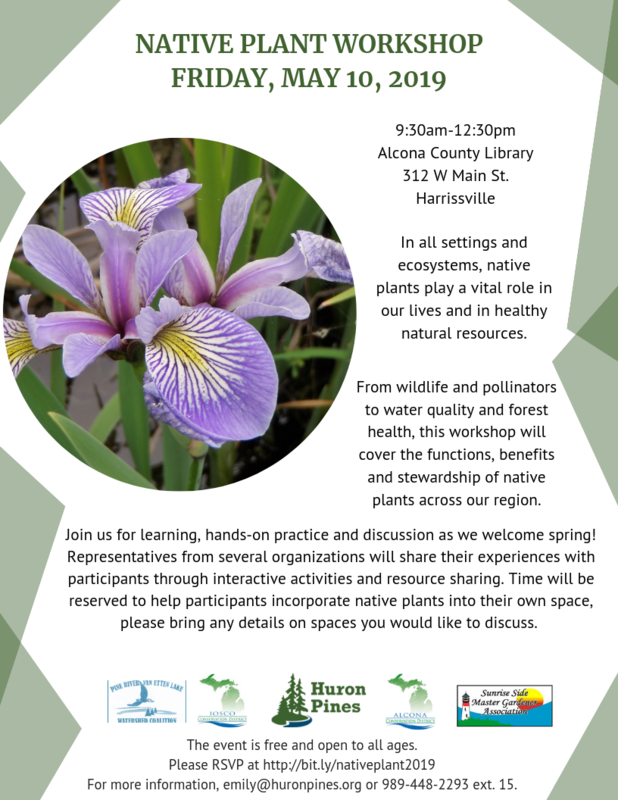 Come join us on May 23rd and tour some of Alcona County's more impressive private, well managed, lands! You can expect to learn about active forest management, cost share programs, wildlife management, and forest health. Saturday April 5th from 10 am - 1 pm. Cancellation policy: For cancellations made prior to the placement of the nursery order for rootstocks by the District, a date yet to be determined, a full refund will be given. For cancellations afterwards, $10.00 of your registration fee will be refunded ($15 retained to cover the cost of rootstocks and their shipping, and other incidentals). Saturday March 29th 10a.m.- 12p.m. When: Saturday January 25th 11a.m. The Alcona/Iosco Conservation Districts are hosting a free mushroom identification hike. This event will feature the expertise of the Michigan Mushroom Hunters Clubs Sister Marie Kopin. Where: Iosco Conservation Districts Ingalls Property. The property is located on Bishoff Rd. North of the intersection between Monument Rd. and Bishoff, just 10 minutes East of Tawas City. Signage will be posted at the intersection. U.S. Forest Service (USFS), and Sunrise Forestry Consultants. Borer Mitigation techniques for dealing with these threats will also be provided. diversity on privately owned lands. attend. Please bring/tell a friend! Please Register! For this event by phone at (989) 335-1056 or by email to andrew.beebe@macd.org by Oct. 1st, 2013. If you need an accommodation to participate in this event, please let us know by September 25th, 2013. Visit www.alconaconservation.org or call the number above for more details. Please Join Andy Beebe and Sunshine Love with the Iosco Conservation District for a walk around Oscoda’s neighborhoods. They will be identifying and describing unique features about trees you see every day. When: Sunday September 29th from 1-3 p.m. Please visit the "Spring Tree Sale" tab to view the sale brochure and order form. Order deadline is Friday, March 22nd, 2013. We look forward to seeing the look on your face as you take in that "new tree smell". Our District Forester, John St. Pierre, will be on hand to field your tree planting questions. The Alcona Conservation District's "Forestry Assistance Program" (FAP) will host a FREE Outreach Event detailing several techniques private forest landowners can utilize to improve wildlife habitat on their land, through active management. 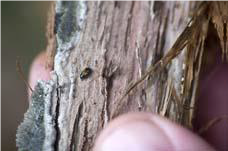 The topics and management techniques covered will focus heavily on common timber types found within Alcona and Iosco Counties. Presenters will discuss various wildlife habitat(s), with an emphasis on jack pine ecosystems, oak dominated stands, and the benefits of early successional forests across the landscape. Recommended native plants species to consider establishing, and invasives to avoid, to improve wildlife habitat will also be discussed. Please Register: for this event by Wednesday, April 24th if you plan to attend. Thank You! Hosted by the Alcona Conservation District, this FREE event will provide informational presentations about programs and land use techniques private landowners can utilize to improve revenue and reduce costs associated with Non-Industrial Private Forestland. In partnership with Natural Resource Conservation Service (NRCS), Metcalfe Forestry LLC, and Jacques Forestry, LLC - Huron Consulting. Soil Conservationist Bryan Zabel, and District Conservationist L.J. Donahue will discuss pertinent NRCS cost-share programs available to private landowners. 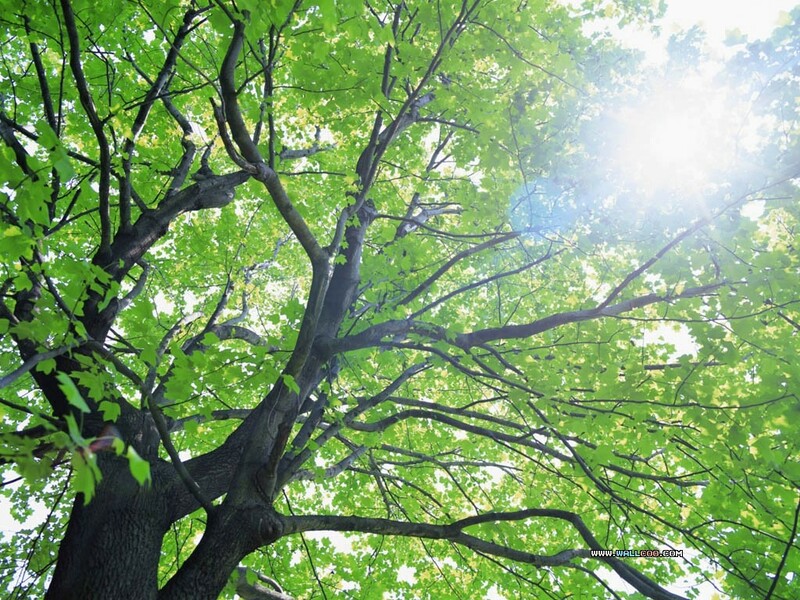 An explanation of the Qualified Forest Program (QFP), Commercial Forest Act (CFA), and Timber Taxation laws by Bryce & Susan Metcalfe of Metcalfe Forestry LLC. Tom Jacques of Jacques Forestry, LLC - Huron Consulting, will explain efficient methods of acquiring and or selling forested property. Everyone and anyone is welcome to attend and please bring a friend! Free informational handouts, food, and knowledge will be provided. Please register for this event by phone (989)724-5272 or by email to John.St.Pierre@macd.org by February 13th, 2013. If you need an accommodation to participate in this event, please let us know by February 11th, 2013. Hope to see you there!! Tom Jacques from Jacques Forestry, LLC - Huron Consulting, is seen here discussing the variables to consider when buying and/or selling forested property during our February outreach event. Thank you to our presenters and to all of those who attended this event! We look forward to the next educational outreach program. Bryce Metcalfe of Metcalfe Forestry, LLC, leads the Forestry Field Seminar on September 22, 2012 on a private landowner's property. Here he talks about regenerating Aspen following a sustainable timber harvest. Thanks, Bryce, for a great day of education and information!